A few hours ago Microsoft released the first public CTP of SQL Server 2014. The download and the installation went very smooth, the only new restriction is that you are not allowed to install the CTP 1 version in parallel with any other SQL Server version. Aaron Bertrand has blogged about that new behavior. In this blog posting I want to give a brief overview how to make your first steps with Extreme Transaction Processing (XTP) that was formerly known as Hekaton. If you want to have a good overview about XTP, I recommend Kalen Delaney’s whitepaper about it, and the research whitepaper titled High-Performance Concurrency Control Mechanisms for Main-Memory Databases (can be downloaded here) that was released by Microsoft Research. --Add MEMORY_OPTIMIZED_DATA filegroup to the database. After you have created the new FILESTREAM file group, you have to add a new file to the file group. Every table in XTP needs a primary key constraint that must be a Non-Clustered Hash Index. Clustered Hash Indexes are currently not support. You also have to specify the bucket count with the BUCKET_COUNT clause. And finally you have to mark your table as MEMORY_OPTIMIZED. Congratulations, you have created your first Memory Optimized table – it wasn’t that hard! -- No IX, X locks anymore! Before XTP this behavior was only possible by enabling Optimistic Concurrency within the database – Read Committed Snapshot Isolation or Snapshot Isolation that was introduced back in SQL Server 2005. Accessing memory optimized tables using the READ COMMITTED isolation level is supported only for autocommit transactions. It is not supported for explicit or implicit transactions. Provide a supported isolation level for the memory optimized table using a table hint, such as WITH (SNAPSHOT). The current transaction attempted to update a record that has been updated since this transaction started. The transaction was aborted. Uncommittable transaction is detected at the end of the batch. The transaction is rolled back. We were just running into an Update Conflict, and SQL Server has rolled back the 2nd transaction. I have not expected that, but I have to think a little bit more about it. Again, there is no wizard, just a simple T-SQL script template that you can use. Native Compilation means that SQL Server is compiling the whole stored procedure down to C/C++ code in the background – the performance will be awesome, because we are now executing directly native code within SQL Server. The following script shows how a simple XTP stored procedure looks like. Because you are now dealing with native code, there is no Execution Plan anymore! Have fun with performance tuning… An ALTER PROCEDURE is also not supported (doesn’t make sense, because of the native generated code), means you have to DROP and CREATE the stored procedure again, if you want to make changes. This was a short walkthrough of XTP that I have encountered in the 1st hour after installing the CTP1 version of SQL Server 2014. More information and additional content will definitely come. You can download the whole T-SQL code that I have shown in this blog posting here. 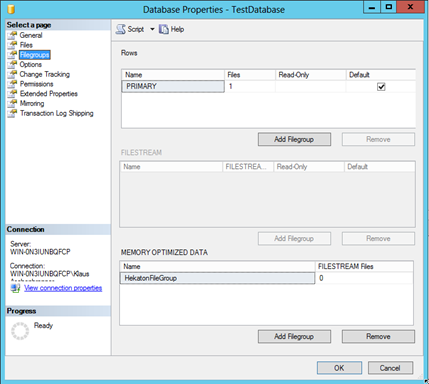 Call to action: Download the CTP1 of SQL Server 2014, play around with XTP and all the other nice cool features. Please feel free to leave a comment about your experience and your opinions about Extreme Transactional Processing.